I recently tested a piece of equipment to make office work more active. Called the FitDesk, it’s a small but functional workspace mounted atop a stationary exercise bike. 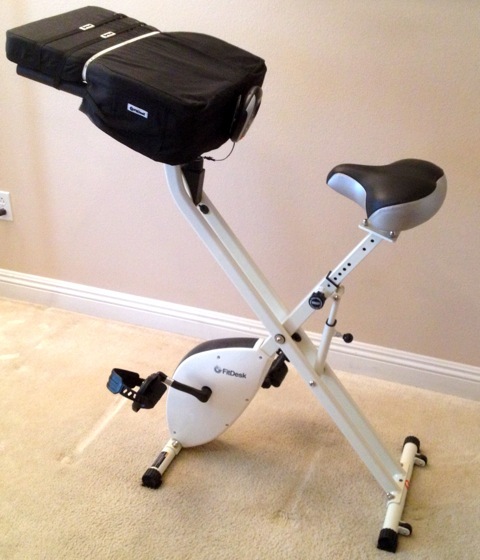 So you can burn calories pedaling while you work on your laptop or tablet, watch TV, or play video games. I thought it was an interesting concept, so I picked up one to review and gave it a good 30-day trial of regular usage. 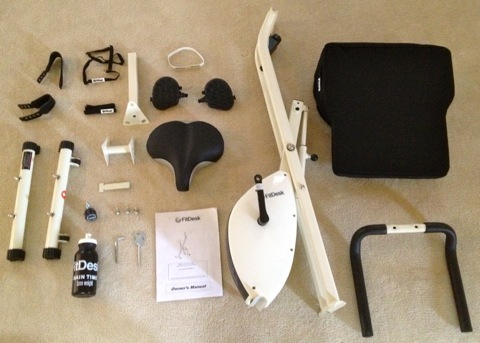 Here’s a pic of the FitDesk parts out of the box (minus the control panel). As you can see there aren’t a huge number of pieces. The FitDesk includes a plastic sports bottle too. And here’s a pic of the control panel. The controls are fairly simple, showing elapsed time, speed, session distance, calories burned, and total distance. Assembling the FitDesk was fairly easy and straightforward. It took me less than 30 minutes to put it together. If I were to do it again, it would probably take only half as long since I was being cautious not to make any mistakes. When you pedal on the FitDesk while doing other activities, you probably won’t be pedaling as quickly as you would on a dedicated exercise bike at the gym. I suppose you could do that, but the FitDesk feels like it’s more for casual pedaling to burn some extra calories while you do other tasks. Pedaling hard and fast might make it difficult to work at the same time. The desktop is basically a custom foam block that mounts onto the bike’s handlebars. So the bike is perfectly usable as a separate unit without the FitDesk desktop attached to it. One nice thing about the FitDesk is that it’s very quiet. Pedaling on it is smooth and virtually noiseless. A resistance knob can be adjusted, so you can set it for very light and easy pedaling or turn it up to create a serious challenge. I found the FitDesk seat very comfortable as-is, although I mostly used it for short sessions (usually under 15 minutes at a time, 45 minutes max). The FitDesk does wobble a little while pedaling, but I found it stable enough. It’s a fairly basic exercise bike, so it’s not as stable as an expensive gym machine or even a spinning bike, but it’s comfortable and easy to use. The FitDesk comes with straps that hold your device in place, such as a laptop or tablet. In practice these work pretty well. There are also small side pockets you can use to hold a cell phone. As for fulfilling its intended purpose, I feel that the FitDesk does a very good job of that. It operated as advertised, and I didn’t encounter any significant problems with it. That said, I did notice some areas where the FitDesk could be improved. These possible improvements are in the realm of adding polish and making it slightly more user-friendly, as opposed to significantly altering its design or operation. Note that the model I reviewed was the FitDesk X. This is an evolving product, so some of these areas for improvement may not be relevant to other models that are developed. First, even when I used the included seat height extender and set the seat to the tallest setting possible, my knees would often intermittently touch the underside of the foam desktop. I’m 6’0″, so if you’re taller than this, you might find the FitDesk less user-friendly than a shorter person would. I doubt anyone 5’10” or shorter would encounter this problem though. Second, I found the control mounting to be inelegant. The control panel has a metal hook on the back that hooks through a slit in the cloth desktop cover. The control hangs down from there, so you can’t see the front face of it while you’re pedaling. If you want to see the readout, such as to note how many calories you’ve burned, you have to reach down and lift up the control panel slightly, so you can read the face of it. This might not be an issue for you if you don’t feel a need to check your progress too often, but if you prefer a display you can instantly check at a glance, then this issue might annoy you a little. It’s also fairly easy for the control panel to slip loose and unhook from the cloth cover, causing it to fall. I doubt it would fall hard enough to suffer any damage, but the overall design of this element seemed awkward to me. Also, there’s no backlighting on the display, so you’ll need another light source to see it. If you want to share the FitDesk among multiple users, they may need to adjust the seat each time. This requires unscrewing a knob, adjusting the height, and then screwing the knob back in. I would have preferred a simple metal peg that could be quickly pulled out and then reinserted, such as you’d find with a weight stack on a gym machine; that would make height switching much faster. When my daughter and I shared this FitDesk, we found it mildly annoying to have to unscrew and re-screw the height adjustment knob every time we traded off. If your FitDesk is just for your own use, or if you’re swapping it with people who are roughly the same height as you, then this won’t be a problem. Moving the FitDesk around was fairly easy. It has wheels on one side and only weighs 33 pounds, so you can fold it up and roll it around with little trouble. I did observe, however, that the rubber feet on the bottom of the FitDesk have a tendency to twist in place when moving the FitDesk around, so I would sometimes have to readjust them after moving it. Otherwise the feet might not be facing downward, which could make the FitDesk a little less stable and more wobbly during usage. Taken together, these quips are all pretty minor, and they may not matter much to you. 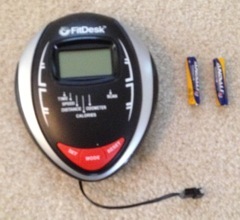 If you’re accustomed to a certain level of polish in consumer products you use regularly, you might find the FitDesk somewhat lacking in that area. The net effect was that these niggles reduced my feeling of pride of ownership, and so I haven’t felt as excited about taking advantage of the FitDesk as I might have otherwise. That said, I still like using the FitDesk now and then. I just don’t love it in the same way I appreciate products that exude top-notch design work. In practice I liked using the FitDesk for taking short breaks. It was a nice way to burn an extra 25-50 calories periodically throughout the day, to get my heart pumping, and to refresh myself away from my regular desk. Without much effort I could easily burn an extra 150-300 calories each day. As for prolonged usage though, I didn’t find it very practical for that. I never quite got used to typing while pedaling, so even answering personal emails with the FitDesk wasn’t my cup of tea. I did that for a while when I was testing it, but once the novelty wore off, I found it faster and easier to return to my old work habits. One thing that surprised me, however, was that my daughter really liked the FitDesk. She was 12 at the time we were testing it (just turned 13), and she would hop onto it and burn 200-300 calories at a stretch. While riding the FitDesk, she would do her texting, watch YouTube videos on an iPad, or play iPad games. The FitDesk was just the right size for her. One day she got so into it that in combination with some time on an elliptical machine, she burned a total of 1200 calories in one day. For her that’s about the equivalent of running a half-marathon. Unfortunately, as with myself, once the novelty of the FitDesk wore off, she grew bored with it and didn’t seem interested in using it anymore. I can still get her to ride it if I nudge her to do so, but then it’s my nudging rather than her genuine interest that’s getting her onto it. Where I could see the FitDesk really shining is for gamers who want to shed a few pounds, especially if you’re into consoles or mobile gaming. It would be pretty easy to slowly pedal the FitDesk while gaming for extended periods. If the FitDesk interests you, I’d say the main question is whether you’re willing to adjust your work and/or lifestyle habits enough to make the FitDesk worthwhile for you. Are you doing a lot of sedentary work that could easily be done while lightly pedaling at the same time? Do you normally spend hours sitting down each week playing console games or watching TV? I love the concept behind the FitDesk (making sedentary activities more active), but I’d like to see a little more polish and user-friendliness in the implementation. If the niggles I pointed out don’t matter to you though, or if you like using a stationary bike and you don’t mind pedaling a little while doing other tasks, then the FitDesk could be a nice match for you.